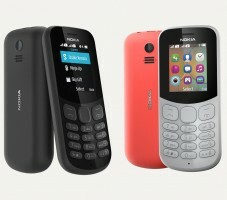 The Nokia 105 is almost the same as its predecessor but adds a bigger 1.8″ display. 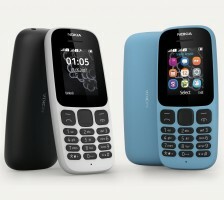 There’s an 800mAh battery aboard that promises 15 hours of talk time and a month’s worth of stand by. There’s an FM Radio on board too, but network support is limited to 2G. 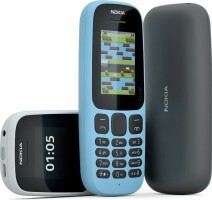 The Nokia 130 shares the 1.8″ display size but its 8MB of storage can be expanded by up to 32GB through a microSD card. There’s a camera on the back that’s also capable of capturing video and Bluetooth support. 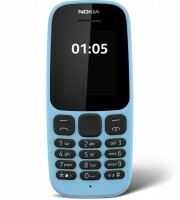 The battery is beefier at 1,020mAh, and it can cope with 11.5 hours of video playback and 44.5 hours of FM Radio. 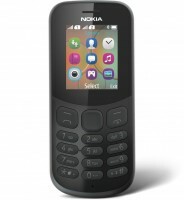 There’s an LED flashlight on top – like on classic affordable Nokias.